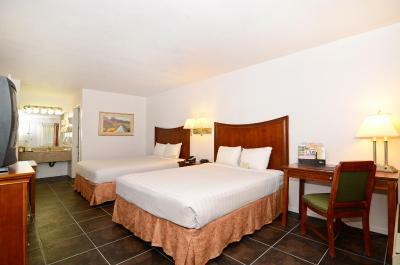 Lock in a great price for Rio Del Sol Inn Needles – rated 8.2 by recent guests! Beds are super comfy. Gas station, subway and near by. Easy to get to freeway after a nice sleep in the comfy bed. Worth trying if I need a decent hotel for night halt in a long trip. Staff was very friendly and helpful. Told us where to get a good dinner. Room was perfect for the price. We only stayed one night but I would stay here again. The man at the front desk was really helpful and wanted to accommodate my special requests. This room was in the way. The room has almost everything you need. The front desk staff was wonderful! I like this little motel, quiet place, helpful staffs, comfortable rooms and completed facilities. And the price is reasonable. This inn doesn't provide breakfast in their site. But they give us breakfast ticket in a nearby restaurant which is very good. The complimentary breakfast was at the adjacent restaurant. Good food with friendly service. Comfortable rooms and quiet. Comfortable bed. Nice linens. Hairdryer and soaps. It was right off the interstate, so very convenient. The free breakfast was at a local restaurant so it was a great deal. We came in late and left early so didn't spend a lot of time at the property but the night staff was very friendly. Rio Del Sol Inn Needles This rating is a reflection of how the property compares to the industry standard when it comes to price, facilities and services available. It's based on a self-evaluation by the property. Use this rating to help choose your stay! One of our best sellers in Needles! 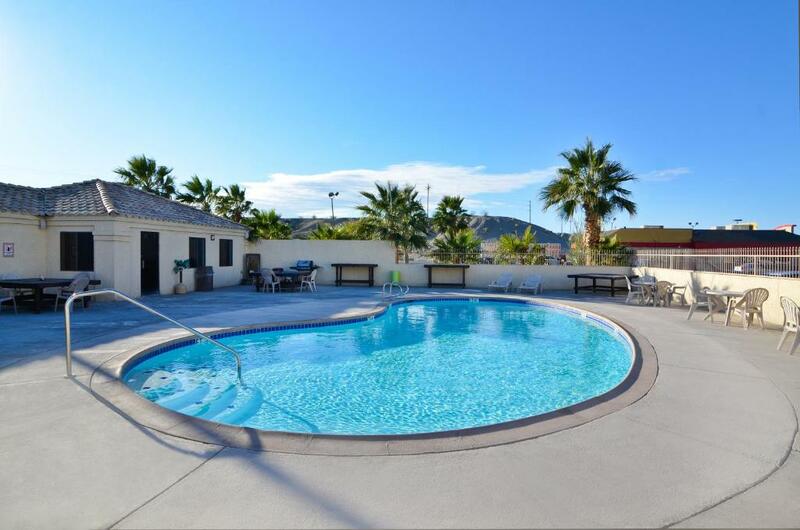 Located just 1 miles from Rivers Edge Golf Course, this California hotel features an outdoor pool. Rio Del Sol Inn Needles offers satellite TV with HBO in every room. A microwave, refrigerator and coffee maker are provided in the contemporary, warm colored rooms. Guests can also enjoy free Wi-Fi and free local calls. 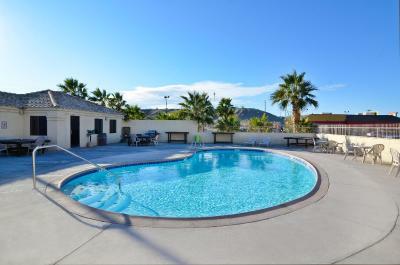 The pet-friendly Needles Rio Del Sol Inn offers a sundeck along with an indoor hot tub. The California/Arizona border, Needles Regional Museum and Needles Recreation Area are within 2 miles of the hotel. Goose Lake is a 15-minute drive away. This property also has one of the top-rated locations in Needles! Guests are happier about it compared to other properties in the area. This property is also rated for the best value in Needles! Guests are getting more for their money when compared to other properties in this city. When would you like to stay at Rio Del Sol Inn Needles? Room features a cable TV, refrigerator and microwave. Room features a cable TV with extended channels, refrigerator, microwave and iron and ironing board. House Rules Rio Del Sol Inn Needles takes special requests – add in the next step! Rio Del Sol Inn Needles accepts these cards and reserves the right to temporarily hold an amount prior to arrival. Please note: There is tax added to the pet fee. Please contact property for details. Carpet looks old and seems it never got updated. Feels lonely post sunset. Breakfast was to be included but it wasn’t. We were offered a discount at a local restaurant but it wasn’t convenient for us. Very noisy area..trains, cars, people and the air conditioner was extremely loud. Also, I booked this place so I could have a swim after a long day in the car. Pool was dirty, although not entirely their fault as the spring buds were falling from the trees. Unfortunate, but still disappointing. Staff were lovely and very accommodating. Discussed the noise level as we were checking in and put us in the room that may not be as affected by the trains etc. Very helpful and most pleasant. When we needed somewhere to stay on our way back to LA, Needles seemed like a good place to stop and we chose the Rio Del Sol Inn based on the previous reviews on Booking.com. We’re very happy we did. The stay was exactly what we had hoped for. Clean and tidy, comfy beds, friendly staff and good value for money. Options to eat nearby and right on the classic Route 66. Thank you. I like the staff was very friendly very knowledgeable courteous and they go out of their way to make sure you're happy satisfied would recommend this place to anybody very clean inside giggling Cactus is the bomb .. The only thing wrong was the shower. The water pressure with that shower head was way to high. We joked that it felt like needles (get it) otherwise everything else was good. air conditioner made noise and I couldn't keep it on at night. The place is in a gas station parking lot. Ugly. Apparently we are eliminating blankets from beds in rooms now. Only the sheets! The bed and pillows were horrible. The coffee “thing” brews one cup at a time into a paper cup. Come on! Lots of rough type men hanging out in open rooms and the hallways. I didn’t feel safe. I wouldn’t stay here again. Oh and disregard any mention of breakfast. There is no coupon and no food in the am. The hotel is next to a freight train line which had trains running regularly throughout the night. We were placed a far as possible from the line however the noise was quite loud. The hotel could not serve breakfast, I have a go to another restraunt nearby.